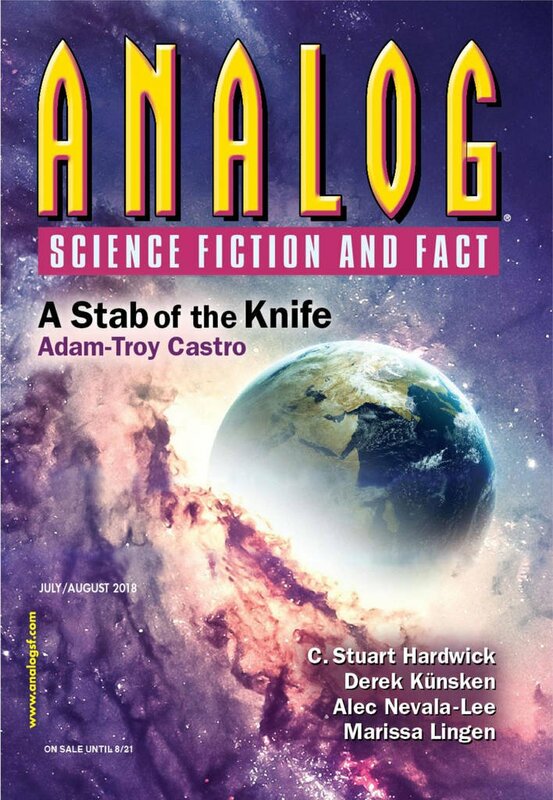 "Here&apos;s Looking at You, Cud," by M. Bennardo [bio] (edited by Trevor Quachri), appeared in Analog Science Fiction and Fact issue 07-08|18, published on June 15, 2018 by Penny Publications. Pro: A cute, unreliable-narrator story. The protagonist’s faith in his abilities to tell real from fake doesn’t match with reality, and we gradually realize this as the story unfolds. His ex was genuine, as was his partner. He doesn’t deserve either, and ends up alone—and still ignorant of his own shortcomings. Con: For such a serious story, the premise is awfully silly.